Never did I think that I could be so controlled by anyone. He is 3 feet high, talks to me about everything and is so cute. All he has to do is mention something and I start looking for and trying to get it. His Aunt and Uncles are worse. 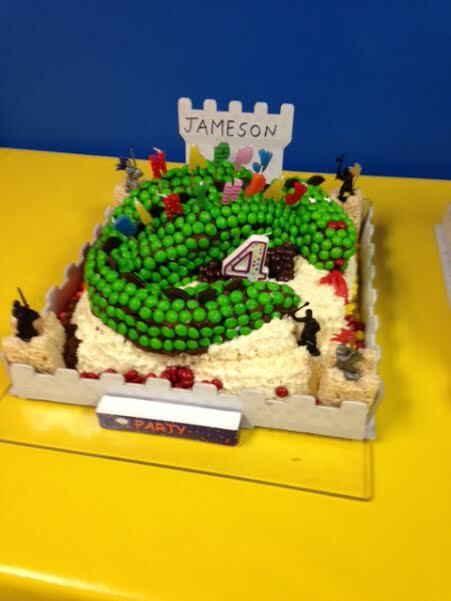 So this week he said he wanted a dragon cake for his birthday. On Thursday he helped me bake the cakes. He wanted white, strawberry and chocolate. After we baked each cake he had to taste it. Thank God they passed the test. I googled dragon cakes and finally picked one. The recipe called for all frosting but of corse I had to change it. After assembling the cake I skim frosted the cakes and then decorated them with green skittles. It took 7 bags of skittles because all I needed was the green. It took several hours to decorate and that was the fun part. I did make the head and feet out of rice crispy squares because they are firm and easier to mold. The small turrets on the corners were also rice crispy squares molded into the size I needed. Pieces of chocolate made the spine scales and cut red licorice made the fire from his mouth. The feet are covered with the purple skittles and the nose and mouth are the red ones. The rest of the cake was just decorated with frosting. Oriental Trade magazine had a castle cup cake stand and I used the bottom as a tray. I also used some of the extra skittles to fill in the spaces around the cake. My grandson loved it but didn’t want to cut it. A lot of work but well worth it.